By providing homes which can withstand the weather, a clean water supply and decent sanitation, the Quicken Trust is transforming the lives of hundreds of people in the needy village of Kabubbu in Uganda. British Airways and Samaritans Purse International have helped fund boreholes in the area. 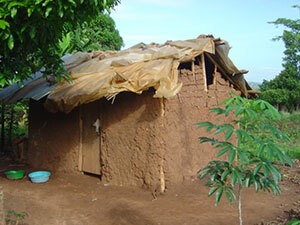 Traditional homes are made from woven bamboo and mud with a thatched roof. 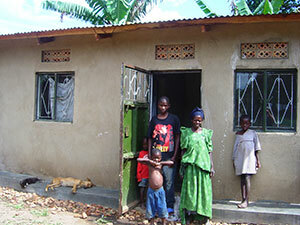 About 70% of villagers own their own homes. But many cannot afford to maintain them – and these homes are vulnerable. The mud walls can disintegrate in heavy rain. The thatch rots in wet weather. Many householders resort to plastic sheeting to keep out the rain. Local builders and UK volunteers have helped the Quicken Trust build more than 160 new homes. These are made from locally-produced bricks. Quicken Trust has also built community housing for some of those in worst need. Upgrading to an Outside Loo! 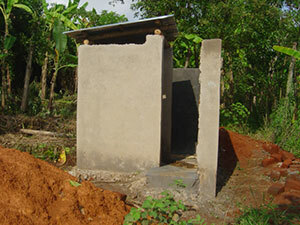 Sanitation can be a big problem in a rural environment. For traditional homes, the WC is little more than an outdoor compound surrounded by bushes. There is no running water and no drain. Good sanitation means better health for the people of Kabubbu. 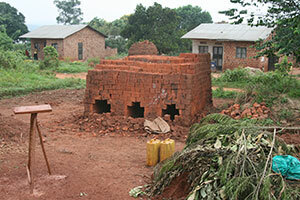 Quicken and its supporters have provided money to build over 120 pit latrines for family homes in the village. Nine boreholes have been built around the community to enable local people to get fresh water. It’s a vital step in improving hygiene and health. In Kabubbu the only option used to be to fetch water from a local stream. More than 400 houses in and around Kabubbu have been provided with bio-sand filters which will cleanse the foulest water supply. They were provided in partnership with Samaritan’s Purse International. These mean villagers have clean water, on tap.